The No7 Amazing Foundation Match! Today Boots No7 launch their Foundation Match Made Service. I know that many of you will be groaning with horror at the idea of yet another overbearing sales assistant applying stripes of different foundations to your jawline, but stay with me on this one. The match service from No7 doesn’t rely on the (sometimes dubious) eye of the sales assistant, neither does it rely on your own (often dubious!) opinion of which shade you should be going for. 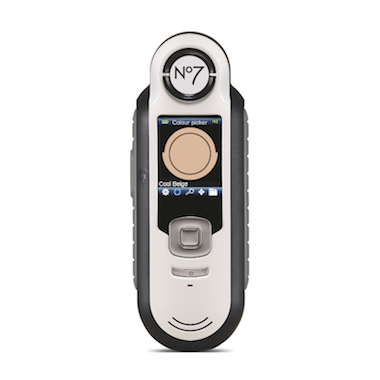 The assistant uses a handheld device to precisely read the different colour tones in your skin and match them to the best fit from No7’s skin-true shades. No space for human error here! The device takes into account all of the different tones in your skin (it’s quite weird when the picture of your skin comes up in the little screen) and then decides on a kind of mean average, for want of a better phrase. Does it work? Yes. The foundation picked out for me (deeper ivory) disappeared into my skin without a trace. Very, very impressive and no need to go and stand outside in the daylight trying to remember which stripe of foundation was which! I usually despair at these types of gadgets (I got quite cross with one lady in Selfridges who tried to measure my dehydration levels) but this one is so objective and clear that you can’t really argue with its usefulness. Foundation matching is available in most Boots stores that have a No7 sales advisor – let me know how you get on if you try the service! There a a few different foundation textures and finishes – I tried the Stay Perfect version, but I think that I like the look of the Instant Radiance better! I shall be giving that a whirl next time I’m wasting time doing research in Boots. Previous Post The Handiest Sunscreen Ever?